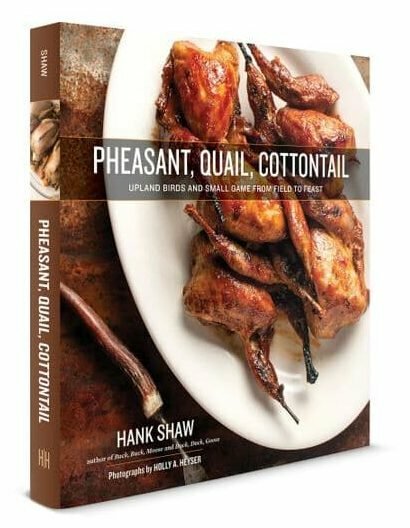 Anyone who has read this space for any length of time knows how much I love wild game recipes that are outside the Western tradition. It’s not that I dislike the foods of Europe or America, it’s just that I am fascinated with how the rest of the world treats its game — after all, most of the cultures on this planet hunt. So thanks to Fuchsia Dunlop, whose Chinese regional cookbooks always have at least a few game recipes. I found this dish in her Sichuan cookbook, Land of Plenty. I have modified her recipe to suit wild rabbits, which are smaller, denser and can be a lot tougher than a domestic bunny. Squirrels will also work really well in this recipe, too. Oh, and if you are skeeved out by eating rabbits and squirrels, you can use chicken as a replacement. But I hope you possess the intestinal fortitude to cook with rabbit. I’ve done a few other riffs of Dunlop’s work, including kung pao pheasant, which is one of my favorite pheasant recipes. Back to this Chinese rabbit dish. Blessed with a rabbit that Holly brought home, I wanted to make it stretch for the two of us. This recipe did the trick. Basically, you gently braise the rabbit, then pull or cut all the meat off the bones. 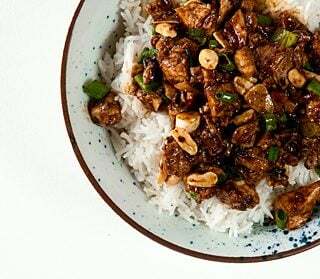 Cube it, then toss the meat with a spicy mixture of chile paste, black bean paste, soy, scallions and peanuts. It’s pretty damn awesome, especially if you make the special topping Dunlop attributes to a Chengdu woman named Chen Yonghui: peanuts, Sichuan peppercorns and toasted sesame seeds, all toasted and ground. A word on Sichuan peppercorns. They’re not actually pepper, and there is no substitute. They are very floral, almost citrusy — and they make your mouth a little numb. You can skip them, but using them makes this dish really authentic. Sichuan peppercorns can be found in some supermarkets, or you can buy them online. Figure on 1 cottontail rabbit per person if you are a hearty eater, but you can easily make one rabbit stretch for 2 people if you have a lot of rice. One domestic rabbit will easily feed 2-4 people. Most of the ingredients here are easily available in large supermarkets, and all are staples in Asian markets. There's no real substitute for the black bean paste or the Sichuan peppercorns, unfortunately. Simmer the rabbits. You can cut up your rabbits, or you can just chop them in half with a cleaver -- you're going to pull off the meat anyway. Cover them in water in a large pot and add the ginger, onion and 3 tablespoons of soy sauce. Bring to a boil, then drop the heat to low so you barely have any bubbles. Simmer like this until the meat wants to fall off the bone, maybe 45 minutes to an hour, or up to 2 hours for an old squirrel. 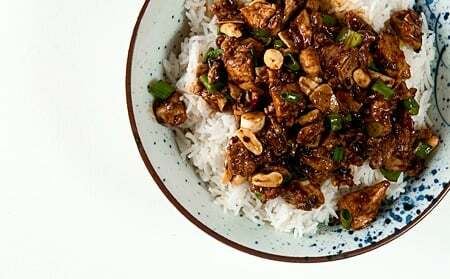 While the rabbit is cooking, make the topping by toasting the sesame seeds, sichuan peppercorns and minced peanuts in a dry pan over medium-high heat until they are fragrant, about 1-2 minutes. Move to a mortar and pestle and grind roughly. Set aside. When the rabbit is done, move it to a platter and allow to cool somewhat. Strip the meat off the bones and chop into cubes. Set aside in a large bowl. In a wok or a saute pan, heat the peanut oil over high heat. Add the black bean paste and the chile bean paste and stir-fry for 30 seconds to a minute. Turn off the heat and mix in the sugar, sesame oil and remaining soy sauce. 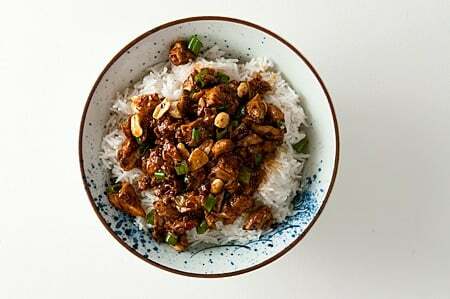 Pour the sauce into the bowl with the rabbit and toss with the peanuts and the scallions. Serve at once over rice. Christine: Not much. I like to lightly crush about a teaspoon or less and toss them in about 90 seconds before the stir fry is done.